Electric car makers back charging scheme | What Car? Electric car makers Citroen, Mitsubishi, Nissan, Renault and Peugeot have pledged to back EV Ready a scheme that will ensure conformity across Europe's growing electric car charging infrastructure. The EV Ready scheme would mean that electric vehicles and public recharging points would use the same technology, making electric-car ownership easier. 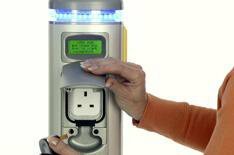 More than 60 European companies including energy providers, network operators, suppliers and installers of charging stations are already working to develop and adopt the scheme.